The past two weeks have been mixed with days of beautiful sun and days of nasty humidity and stormy weather. On the less pleasurable days we have spent time working on indoor skills with Aiden like leash manners and not sniffing the floor as we walk through the mall. During these days Cessna usually sits by my side patiently waiting for Aiden to figure out what is being asked of him, but some days she sees that we are taking him and decides that she wants to stay home. I guess she gets frustrated with all the repetitiveness and standing around. 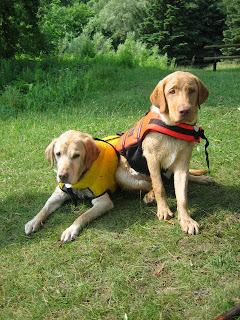 On the more sunny and sometimes humidy days we have gotten into the habit of packing up a picnic and heading off to a local conservation area with the dogs. They love to swim and romp around together like lunatics. I guess they too need their time to just let it all loose. On Monday of this week we ordered some Swiss Chalet and headed off to Shade’s Mills Conservation Area in Cambridge. The dogs had a blast running in and out of the water and at times running off to greet another dog and their owner. Cessna and Aspen spent most of their time chasing a ball in the water, while Aiden and Phoenix spent their time sniffing here and there, trying to find something interesting to get into. We were lucky to catch Aiden each time he found something, but weren’t so lucky with Phoenix who decided it was a good idea to eat a dehydrated dead bird’s head. Lucky for him the bird hadn’t died of something awful because it seemed to have no ill effects on his stomach or health. Aiden seemed to enjoy the water a bit more this time, I’m not sure if it was the fact that I’d put Cessna’s life jacket on him or if he has begun to understand the fun of swimming. He still spent a lot of time on the shore though, attacking the girls for the ball as they approached. He is such a boy, more into the wrestling than into the game itself. 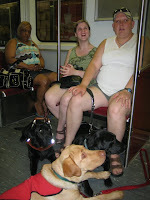 We spent Wednesday in Toronto visiting my friend Lynette and her GDB dog Dee Dee. DeeDee is such a cutie, so small and mismatched in looks. She is not only allergic to cats, but also has an under bite and her eyes are two different shades of brown. She seems to be settling well into her new life with Lynette, but there are still some issues they need to work through, but who doesn’t have those when they first come home. 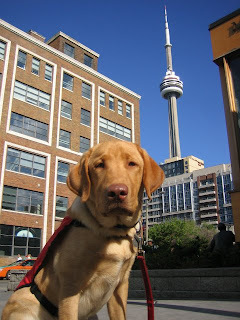 We spent a lot of our time at doctor’s appointments, but also got a chance to walk around the Eaton’s Centre and walk to Mountain Equipment Co-op, a cool hiking and camping store. While there we tried out some self-inflating mats and Aiden made sure to get in some kisses while we were at his level. 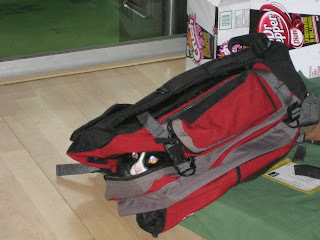 I am really looking forward to our camping trip next weekend. Phoenix will be going to stay with his foster family, while Aiden, Aspen, Cessna, Huib and I head up to Huntsville to go camping at Arrowhead Provincial Park with my cousin, sister and a good friend. Even though it will be a small group, I am sure we will still have loads of fun. I guess the most eventful thing which has happened this week is that my sister’s cat, Branden, has decided that he likes to play fetch with Cessna. He will bring his spongy ball to Brandi (sister) and run after it with Cessna. It is funny to see Cessna running down the hall with a small spongy cat ball in her mouth and Branden sitting at the end of the hall wondering when it will be his turn to catch the ball. I think by the time Brandi and him move back to Huntsville he will be best friends with the dogs.